Based in Port Carlisle, just outside the city of Carlisle in Cumbria, dbgraphics are a small, highly productive business specialising in design and print services. Established in 2002, we offer a wide range of design and creative services for print, banners, displays, websites and just about anything that requires a graphic design input. Whether you’re a small business just starting up and needing a few leaflets and business cards, or an established company looking for a complete rebrand, we’d love to to hear from you. Get in touch on 07796964947 or use the contact form below, and find out how we can help. We design and print pull up roller banners, PVC railing banners, Posters up to A0 size, bespoke exhibition and display materials and much more. Having an online presence is vital – we can design and host your website, design your business logo and provide a full printing service too. Great design and print since 2002! We regularly post examples of our work on Facebook – please click on the feed below and scroll to see what we’ve been up to recently. Coming to the streets of Ivybridge in Devon! Pleased to have been commissioned to create giant billboard artwork for one of our new customers, Dance Lab Devon. Pleased to have designed this unusual medal for the 2019 X Border Challenge. Here’s hoping for a great 2018 for us all! If you enjoy interesting photography, you might like my photography page. Photography of David Boothman - images of the strange, unusual & beautiful that’s all around. Images are © if you’d like to use or own one, get in touch. Super pleased with this splendid design for the Cumbria Innovations Platform. Well received by client and turned around double quick - RESULT! Contact us for prices on leaflets, posters, banners - anything printed. 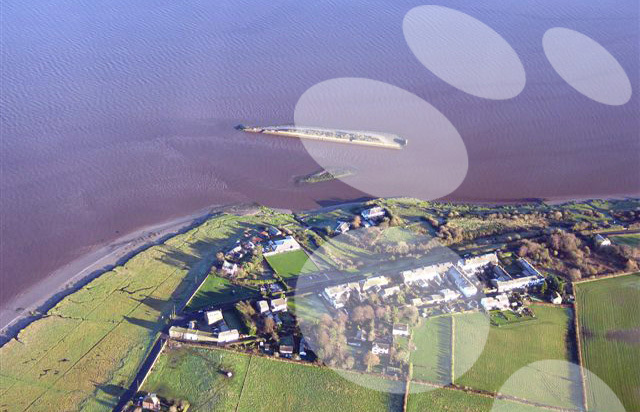 Find out more about the Cumbria Innovations Platform. Just a few of recent designs for our educationalist customers as they return to school after the summer break. We create prospectus', booklets, posters - just about anything printed. A delightful range of leaflets and posters for Daisy First Aid. They provide comprehensive first aid courses aimed at parents and carers towards children's medical emergencies. We've been busy this summer doing the show programmes for one of our oldest and best customers. Razzamataz Theatre Schools provide, in my opinion, the very best in Dance, drama and singing tuition. They are a franchise operation and each franchisee I have as clients are so professional and enthusiastic, it's a pleasure to provide design and print to them. We do such a wide range of work for a broad spectrum of customers. These are some samples of work produced recently. Reports and examinations of serious topics that have detailed and far reaching effects. • Designed on one of the hottest days in June! Nice bright summery leaflet produced for the Rock Youth Project in Carlisle for their Summer Activity programme. Lovely project, client very pleased! Nice retro American diner type menu design for Big Matt's Sandwich Shack; some really tasty sounding things on offer - give them a try! dbgraphics has been trading since 2002 (initially as wbdesign) and in that time produced loads of great design and print work for an extremely wide range of clients, but I still get a thrill from working with new customers! Beautiful range of promotion materials for Helene Wickins Counselling; logo design, leaflets, stationery and website. Stress, anxiety and worry are unfortunately, extremely widespread in modern living. Helene offers a counselling service to help with these issues. I really liked designing this infographic - it has a naive charm and reminds me of a 1960s west coast music poster. Nice project for Advocacy conference in North east with banners, presentation folders, leaflets and a heap of other beautifully designed and printed goodies! Unusual medal design for Endurance Sports and their cross border challenge event later this month. 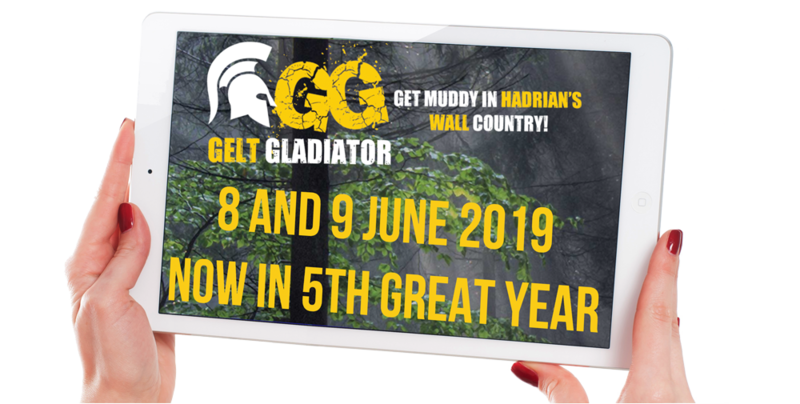 Produced during winter break, for January promotion for Gelt Gladiator. Look out for this promotion on the side of the GG van from 5th January! Lovely colourful and accessible leaflet for John McNamee at Sports Trek Coaching. Very pleased to have been involved for the 3rd time in designing this programme for Razzamataz Theatre Schools for their bi-annual show at Her Majesty's Theatre in London. The show gives students from various schools in the Razzamataz network the opportunity to perform in the West End! Both Mike James at Endurance Sports (customer) and myself very pleased with how this project worked out. Super quick turnaround on this 12 page booklet with just over a week from initial meeting to being sent for printing! Quick turnaround graphic for an upcoming event in 2017, where runners will compete over a (probably) 4 mile course at night wearing head torches! Exciting stuff! This was a nice adventurous and well considered design I enjoyed working on a few years ago. I like the way the planets looked like coloured marbles against the black background! Around 15 million people – that’s one in four of us - will experience a mental health problem this year. Those that will experience a mental health illness aren’t strangers. It could be me, it could be you. They’re our family, friends, colleagues and neighbours. Let's all try and make sure they do not suffer alone. 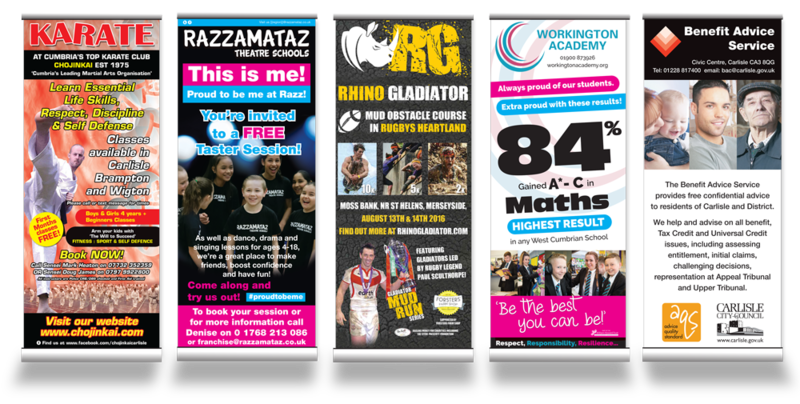 Some really nice display banners for Workington Academy. They've achieved some great results, so well done! Beautiful sunflowers - photo taken at Fuschl am See in Austria. A nice range of leaflets produced for Doug James at Chojinkai Karate, probably one of the best Karate clubs in the UK. 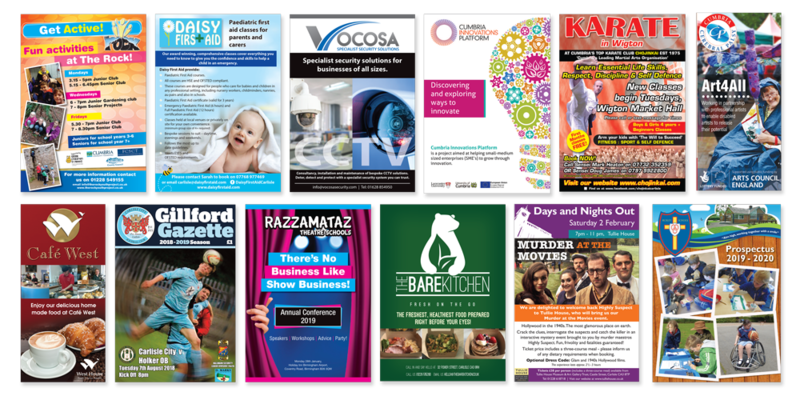 We've produced some really nice show programmes for Razzamataz Theatre Schools so far this year, all corporately branded, but each with its own distinct vibe and look. Super cute logo for Razzamataz Theatre Schools for their pre-school age kids! Nice logo design for new business. Skinny Dinners make yummy, healthy food, delivered to your door! Give them a try! Simple, elegant and functional site for Petals of Cumbria. Websites don't need to be super complicated - in fact they absolutely shouldn't be. Recently completed giant billboard design on the busiest roundabout in St Helens. Client delighted with job. Find out more about the event and book your place! Leaflet job produced for Keldas View Cottage at Glenridding, Ullswater. Great to see businesses recovering after the winter floods in that area. Newsletters are a fabulous way of getting your message across, promoting your business and indeed retaining existing clients. Interesting and fun volunteer recruitment promotion for Chris Tolley at People First. DB Graphics are producing covers for our match-day programmes and excellent quality they are too. We would highly recommend to anyone. Fun, bubbly, colourful logo design for Young People First! Chinese lanterns taken earlier this year on a cold February morning. Ultra quick, simple poster created for the good folk over at People First, promoting their help towards those affecting by the floods of December 2015. This is a calendar I worked on earlier this year for West House. A really excellent service - I use it! Interesting image I took in 2014. Enhanced by black and white. Nice simple little leaflet produced recently for Healthwatch Cumbria, for their maternity services survey. Photo taken early summer this year, a beautiful hazy day at Keswick. Razzamataz Theatre Schools are one of the customers I've been looking after the longest - since they just had one or two schools here in Carlisle. Now of course they're much, much larger with schools in towns and cities all across the UK. Here's one of the signs I fitted in the summer as part of their new corporate ID branding at their head office in Carlisle. A nice little illustrative graphic for our friends over at SportsTrek Coaching for their junior swim school lessons - recently applied window graphics at their pool at Embleton near Keswick. You can also follow dbgraphics on twitter! Pleased to be working with the chaps over at endurance-sports.co.uk on their latest venture, a fabulous rugby themed mud assault course.